Big cups and little cups, cups for coffee and cups for tea, and cups just the right size for memories. One of the last of my grandmother’s china cups and saucers (this was our regular Sunday family-dinner china, as opposed to the company’s-coming really good porcelain kind, and I suppose the cups and saucers lasted the longest because none of us children used them much). It took me forever to figure out what C would be, but once I did, I was flooded with happy memories of all sorts of things that have to do with plain old cups. I went to the yarn shop on Wednesday after all, because they had both of the patterns I was interested in. Good move, because I’ve been able to do the math and adjust for my gauge and fiddle and play, and I think I will have a very beautiful sweater if I use this one – the Side to Side Cardigan. Reverse stockinette on 4.5mm needles will do justice to the yarn, the pattern, and my knitting efforts. That, and I’m pretty sure it won’t pill too much, which Manos tends to do. And it has Annabelle’s tail-swish of approval. And I think I can finish it by February 26th. 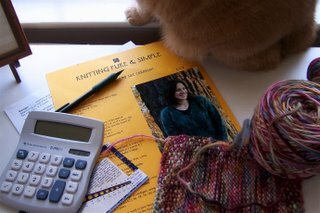 What’s rocking my world is that each and every one of the knitters on the list are striving for their personal best. I’m impressed with each and every name on the list because every name, every one of them is a celebration of two things. 1. Excellence in knitting. Every knitter on the list is trying to stretch their skills. Not everyone is cut out for self improvement, and I’m sure even if you are not part of the olympics you are busy striving for excellence in another element of your life…but all of these names are knitters trying to do it better. That elevates the craft. That makes it personal art. I’m proud of you all. 2. Challenge. Nobody tries to do better without challenge. It is the elevating force of humanity, and at the risk of sounding like a motivational speaker…challenge is good for you. A chinese proverb reads: The gem cannot be polished without friction, nor man perfected without trials. I’m a long way from perfect, but I’m closer for trying, and so are you. Knit on. My knitting energy seems to be very strong right now — and the knitting is good. I finished the Trekking socks, and I started a new pair in Socks that Rock Moss Agate. I think they will be in a stitch called Slipped Stitch Rib, which is in Sensational Knitted Socks, but I’m still deciding. This colorway is bold and bright. We’ll see. Fun cups and stories – got me thinking about how many of my cups have stories, too. Thanks!Yeah, this “training” is fun – and interesting. Because y’know, if I did this much pre-work on every project… I bet my knitting life would be a lot smoother. What do you think? I will love watching your Olympian effort – and be delighted I’m a spectator. Beautiful cups. I love my cups. Each one tells a story to me too.Knit on, my dear. Great cups and stories, love the old fashioned tea cup in its saucer at the end of the row.Can I ask what kind of yarn you are using? The swatch looks quite beautiful. I have two beautiful china cups that my mother bought when she was first married. They were wildly expensive, and didn’t match her very practical china, but she told me all my life that she loved starting her day with coffee from one of those cups. So every morning now I go to the cabinet and choose a pretty cup to start my day. Your Disney mug reminded me of a mug I had in NY – a GIGANTIC – it held seven normal cups worth of coffee – mug of Minnie saying “you think looking this good, this early, is easy?? ?”I wonder where that is… hopefully still packed and not lost…. The right cup is very important! I believe my tea tastes better out of my favorite mugs. there’s just something about a grandmother’s cup.. it’s so lovely – so sweet – and tender. Each cup of tea will bring joy. This one is my favorite :-)My Mom and I used to have tea every sunday afternoon, Earl Grey was her favorite.Knit in joy, dear one.. and we shall all have fun !